Getting around Tokyo was extremely easy on the Tokyo Metro network. Of all the stations we visited, Tokyo Station was the most fun. In Japan, Tokyo Station is the busiest of all stations. The station is multi storied with 5 stories below ground level. There is so much to explore with food stands, clothing stores, restaurants and cafes. They managed to fit an entire shopping mall inside a metro station. 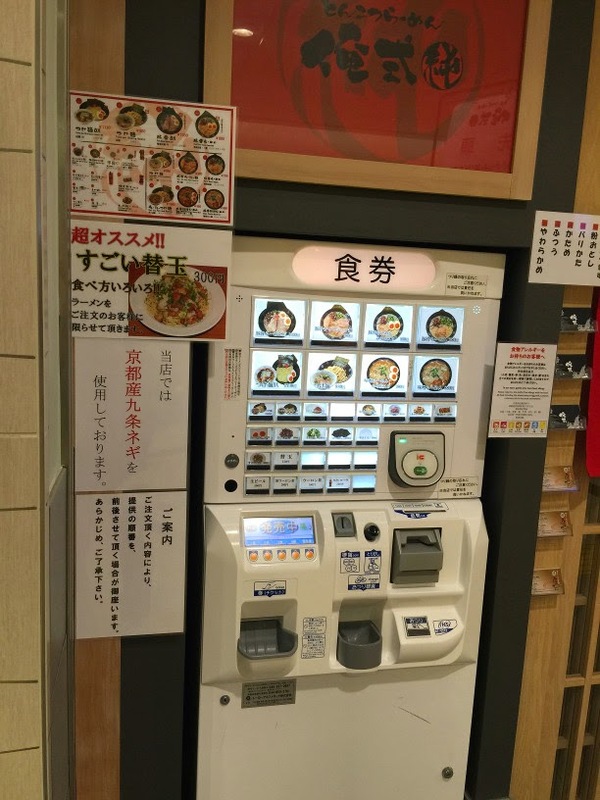 First, we wanted to see the most popular ramen shop in the station: Rokurinsha. This busy restaurant on Ramen Street is the one with the longest queues. We waited in line for about 20 minutes, ordered from a vending machine and then were promptly seated. The vending machine was kind of confusing since there was absolutely no English anywhere. We just sort of looked at the pictures, and picked what looked the most tasty. As soon as we arrived, we learned that this place actually serves tsukemen, not ramen. Think of tsukemen as a twist on ramen where the thick and springy noodles come separately from the broth and fixings (sliced pork, scallions, egg, shredded beef, fish cake, etc). You pick up the noodles, and then you dip them into the thick broth before eating. The broth here is extremely thick and full of flavor, more flavor than any of the fancy ramen places that we have tried around Los Angeles. Slurping is highly encouraged and that’s pretty much all we heard in the restaurant. Dinner for the two of us cost 2,460 yen, or $20.54. This was one of my favorite meals in Tokyo. Our last stop by Tokyo Station, we went to Honda Ramen for more traditional ramen. Honda Ramen is right next to the popular Rokurinsha. The line for this restaurant was much shorter than the one for Rokurinsha. We waited about 15 minutes to get seated. We ordered from the vending machine and a hostess seated us shortly afterwards. The ramen did not disappoint. The flavors were amazingly rich, like an explosion of flavor in my mouth. Dinner cost 2,010 yen for the both of us, or $16.78. If you’re looking for delicious ramen, you can’t go wrong with any of the restaurants on Tokyo Ramen Street. If we had another day to spend in Tokyo, we would definitely try another ramen restaurant here! We didn’t really have to wait in line since we came in off-peak season. I would recommend coming here as early as 5pm for dinner if you want to avoid a long wait at any of these restaurants, especially Rokurinsha. That’s it for Tokyo Station!